Anne Gainsford was born at Crowhurst, Surrey. The date of her birth is unknown. She was the daughter of John Gainsford and his second wife, Anne Hawte, and had a sister, Mary. Anne, or Nan as she was commonly called, joined Anne Boleyn’s household around 1528, and the two women became close friends. Anne Boleyn lent Nan her copy of Tyndale’s The Obedience of a Christian Man, which advocated the divine right of kings and stated that it was the sovereign of a country, not the pope, who was the rightful head of that country’s church. The book was banned, so, when, after being stolen by Nan’s fiancé George Zouche, it ended up in Cardinal Wolsey’s hands, Anne could have gotten in serious trouble. But instead than being angry with her friend, Anne went to the king to complain about its confiscation. The book was soon duly returned to her. Then, Anne encouraged Henry to read it, and he declared it to be a book “for me and all kings to read”*. Henry at this time was trying, without success, to get the pope to annull his marriage to Catherine of Aragon, and it is believed that this book greatly influenced him to split from the Catholic Church and have Parliament pass the Act Of Supremacy. Tyndale, though, opposed Henry’s divorce, believing it to be unscriptural. He was later executed. When Anne finally became Queen in 1533, Nan went on to serve her as her lady-in-waiting. That same year, Nan married her fiancé Sir George Zouche and the couple is said to have had 8 children. Three years after their marriages, Nan was forced to testify against the Queen at her trial. After Anne’s execution, Nan serves her rival and successor, Queen Jane Seymour. When, years later, George Wyatt, the grandson of the poet, decided to write a biography of the unfortunate Queen, his main source was Nan. 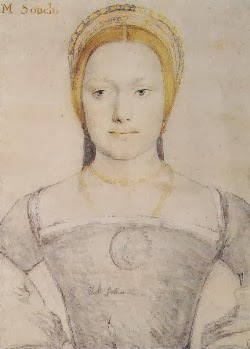 Anne Zouche died in about 1590.